Brixton 1983 by Caroline Thorp , Jane Gifford , Mick Harrison & Ruth Blench. Gloss Paint , Weathershield & Varnish. A Painted Forest and Scenes of Local History Surrounded by Victorian Houses. In 1983 the Bonham and Strathlevan Tenants Co-operative decided to have a mural painted on a long graffitied wall in Mauleverer Road. The group secured funds of £7,000 from the Inner City Partnership and approached established mural artists,Jane Gifford, to create a design. Consultation was held with the local community to find out what they wanted to painted on the wall. The answer was a visual escape from the area so Jane decided to create a final design divided into four themes. The first section of the mural is a large woodland based on photographs of the New Forest. The trees lead into parkland which includes a walled garden referencing one found in Brockwell Park, a local green space in the Brixton area. The park is appears again in the form of a band stand, which use to be in Brockwell Park; this part of the painting is situated between the forest and the walled garden. In the centre of the band stand, there is a large image of the Caribbean, as requested by the resident who wanted to see it when he looked out of his window. There is also a Punch and Judy show; if you take a closer look at it you will see the mural’s name, the date it was painted and the artists who did the main work. Beyond the painted walled garden, appear two horses, one behind a stable door. This is in reference to the previous use of the building as a stable for houses who delivered the post. The painting of this huge mural was carried out by Jane, Mick Harrison, Caroline Thorp, Ruth Blench and students from Chelsea School of Art. It was began in the summer of 1983 and took 4 months to complete being finished by late November. The artists used gloss and varnish and protected it in Weathershield. They also prepared the wall properly by doing some repair work to the bricks before any paint was applied. The mural is now faded but still much loved by local people. There had been plans to repair the mural but this has come to a halt as the current owner of part of the site won planning approval in February 2014 to demolish part of the wall. 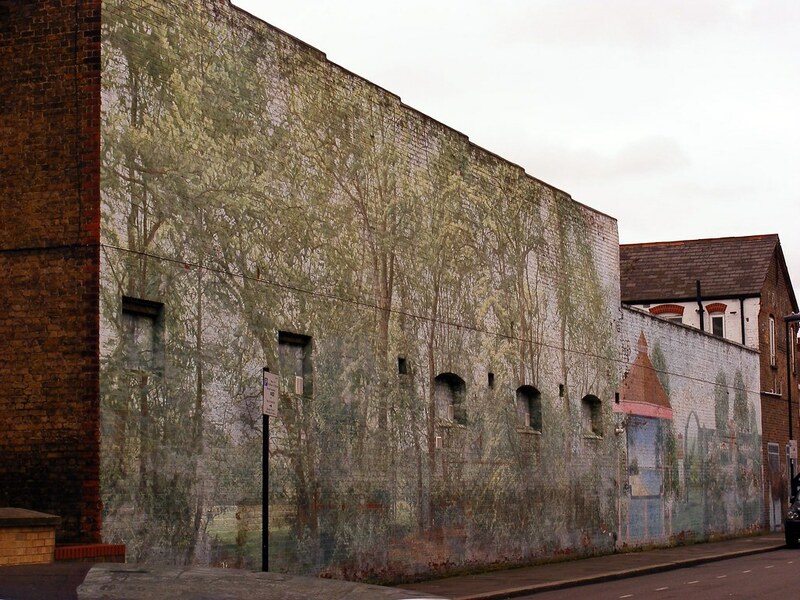 Local people did challenge the planning application and Lambeth Council rejected the application however on the planning appeal the developers won and so at some point, the forest part of the mural will be demolished. As of January 2015, the mural is still standing in its present form. We recommend a visit to look at how wonderful the forest scene is. The mural is quite faded and there is peeling paint usually around water damage. It is also painted directly onto brick so any problems with the wall are obvious. There is a small amount of tagging.